This is the eighth entry in the Bible Junkies Online Commentary on the Acts of the Apostles. The first entry covered some of the major critical, technical and background issues that will concern us as we read through and comment on the Acts. The second post, found here, considered the prologue to the Acts of the Apostles. In the third column, we began to examine the founding of the Jerusalem Church. In the fourth blog post, the coming of the Holy Spirit at Pentecost and the beginning of Peter’s speech was discussed. In the fifth post, the bulk of Peter’s speech was examined. In the sixth entry, Peter’s speech concludes with a successful response according to Acts. The seventh blog post deals with the formation of the apostles and other disciples into a community and the practices of the earliest community. In the eighth column, found below, Peter and John heal a man who was lame. The Acts of the Apostles now turns to the community activities of the apostles, with the initial focus on Peter and John as continuing the Spirit-filled work of the Messiah. Luke’s goal, as Luke Timothy Johnson argues, is to “show how in fact the apostles carry on the prophetic power of Jesus in their words and deeds…The choice of healing a lame man is scarcely arbitrary. It serves several literary roles. As the notes indicate, many of the linguistic details of the story resemble those in Luke 5:17-26; for the reader of his story as a whole, the parallel between the accounts would not be missed: the apostles have the same power to heal as was at work in Jesus” (Acts of the Apostles, 71). These apostles, ordinary men, now have extraordinary power or, better yet, access to extraordinary power. We should note again that they are “going up to the temple at the hour of prayer, at three o'clock in the afternoon” (Acts 3:1). The Greek actually describes them at the Temple at the “ninth hour” (tên ôran…tên enatên), one of the three times of prayer, which also includes the 3rd and the 6th hours. The 9th hour, which was indeed 3 pm, was the time of the evening sacrifices. The point is, of course, that we see Peter and John carrying out their activities in a thoroughly Jewish religious context. When they arrive, “a man lame from birth was being carried in. People would lay him daily at the gate of the temple called the Beautiful Gate so that he could ask for alms from those entering the temple” (Acts 3:2). That he is lame from birth (chôlos ek koilias metros autou = lame since his mother’s womb) is significant for the story since there would be no way for anyone to deny the reality of his disability with him since birth. The temple gate he is laid at, the Beautiful Gate, has not been identified with success, though the suggestions tend to the Bronze Gate or Nicanor Gate mentioned by Josephus and rabbinic literature (Johnson, Acts, 65; T.E. 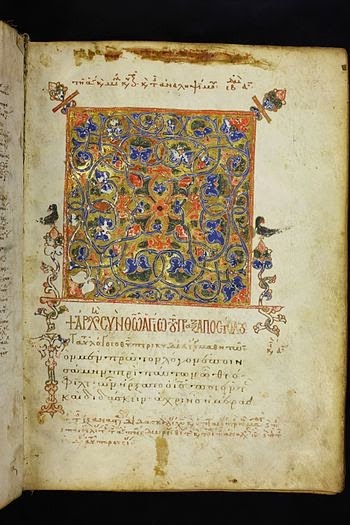 Page, Acts, 97). This gate is described as overlaid with Corinthian bronze not silver and gold, though this bronze held more value than either silver or gold according to Josephus (Jewish War 2:411), which might connect to Peter’s claim a little later on in the story. The man is in this public religious site in order to ask for alms, which he does (Acts 3:3). Peter then “looked intently at him, as did John, and said, ‘Look at us.’ And he fixed his attention on them, expecting to receive something from them” (Acts 3:4-5). His expectation is a natural one since Judaism saw almsgiving as a key component of religious piety and his purpose here at the gate was to collect alms. Peter, though, responds “’I have no silver or gold, but what I have I give you; in the name of Jesus Christ of Nazareth, stand up and walk.’ And he took him by the right hand and raised him up; and immediately his feet and ankles were made strong” (Acts 3:6-7). The act of healing is performed by Peter’s speaking “in the name of Jesus Christ,” the power of which was expressed earlier in Acts 2:21 (Acts of the Apostles Commentary (5)) and in Acts 2:38 (Acts of the Apostles Commentary (6)). Peter does not claim this ability as his, but as something to which he has access through “the name.” The man is healed, his physical disability gone, through Peter’s request through the name of Jesus. In doing so, Peter has replicated healings which we see throughout the Gospel of Luke (e.g., Luke 5:17-26) and which are part of the Messiah’s task (Luke 4:16-30). The formerly lame man now is able to jump and walk and “he entered the temple with them, walking and leaping and praising God.” (Acts 3:8). The image of the leaping man draws us to the messianic image of Isaiah 35:6-9 in which the “lame shall leap like a deer.” Johnson points out that Luke uses seven verbs to describe the lame man’s healing: leaps, stands, walks, enters, walks, leaps and praises (Johnson, Acts, 66). Luke wants to stress that the lame man was truly healed completely by the continuing power of the Messiah working through the apostle Peter. This section ends with wonder all around. “All the people saw him walking and praising God, and they recognized him as the one who used to sit and ask for alms at the Beautiful Gate of the temple; and they were filled with wonder and amazement at what had happened to him” (Acts 3:9-10). Apart from the joy of the man who has been healed, a healing he was not expecting when he came to ask for alms, the people are awed and amazed because they know who he is and his former condition. What happened to this man? Next entry, Peter and John explain what took place at the Temple. Note how the story is attributed to Peter and John, though it is Peter who speaks to heal the man alone. It is possible that the story came to Luke as a story of Peter’s healing of the lame man.